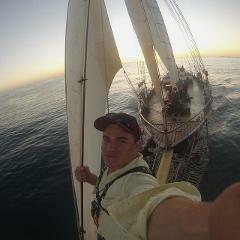 Be part of the crew sailing this 100ft gaff-rigged schooner through Australia's premier World Heritage Listed Great Barrier Reef. There will be many beautiful spots to stop and explore along the magnificent rainforest clad coastline. 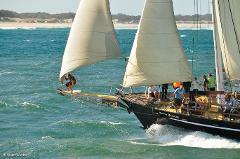 Explore Moreton Bay and the Great Sandy Straits on an epic 5-day "Adventure Under Sail". Price is fully inclusive of food, accommodation, training, safety equipment and GST. 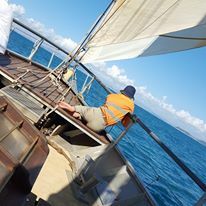 Be part of the crew sailing this 100ft gaff-rigged schooner through the beautiful waters of south east Queensland as she makes her way home from Gladstone at a more leisurely pace than the race on the way up. Bored in the school holidays? We'll liven you up!! 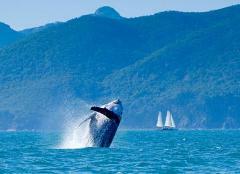 Come and explore the reef from Fitzroy Island up to the Daintree and back. Here's a chance to go to go back in time. 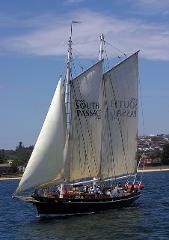 Why not join South Passage on a voyage from Mackay to Rosslyn Bay - a 3-day mini break from emails, timetables and TV as you join the crew to sail a 100ft gaff-rigged schooner the traditional way. Fancy a break from the routine of daily life? Dream of escaping the continuous demands of 24/7 connectivity? 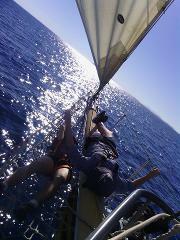 Why not come back in time and be part of a crew sailing a tall ship along the Queensland coast. All meals and training provided. Here's a chance to go to go back in time. 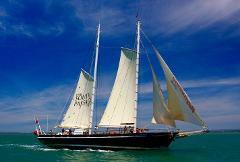 Why not join the crew as we sail from Bundaberg to Rosslyn Bay, a 3-day mini break from emails, timetables and TV as you sail a 100ft gaff-rigged schooner the traditional way up the Capricorn Coast. Be part of the crew sailing this 100ft gaff-rigged schooner through the beautiful waters of the Fraser Coast as we begin our journey north for winter. Fancy a weekend away? Come and join the crew of South Passage - Queensland's own sail training vessel as we sail the Keppel group out of Rosslyn Bay.